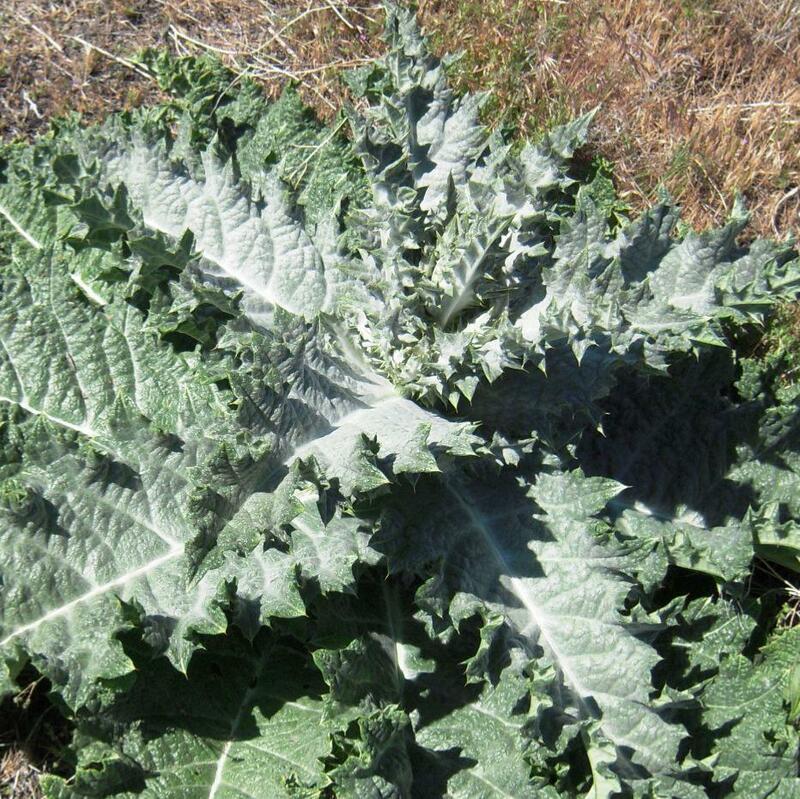 Onopordum acanthium (Cotton thistle, Scotch thistle, Scottish thistle,) is a native to Europe, North Africa and Asia, it is a vigorous, architectural biennial with coarse, spiny leaves and conspicuous spiny-winged stems. A statement plant for the back of the border, or planted as part of a naturalistic landscape where the flowers are much adored by the bees. Autumn is the best time to plant them. Scotch thistle is a biennial plant, producing a large and amazing silver rosette of slightly spiny leaves in the first year.The plants typically exist as rosettes throughout the first year, forming a stout, fleshy taproot that may extend down 30 cm or more for a food reserve,and so is a great clay breaking plant. In the second year, the plant grows 0.5–3m tall and a width of 1.5 m in optimum conditions. The leaves are 10–50 cm wide, are alternate and spiny, often covered with white woolly hairs, with the lower surface more densely covered than the upper and have winged appearance that continues down the stems of the plant. Fine hairs give the plant a silver appearance. The massive, main stem may be 10 cm wide at the base, and is branched in the upper part. The flowers are globe-shaped, 3-5 cm in diameter,from dark pink to lavender, and are produced in the summer from July to September. 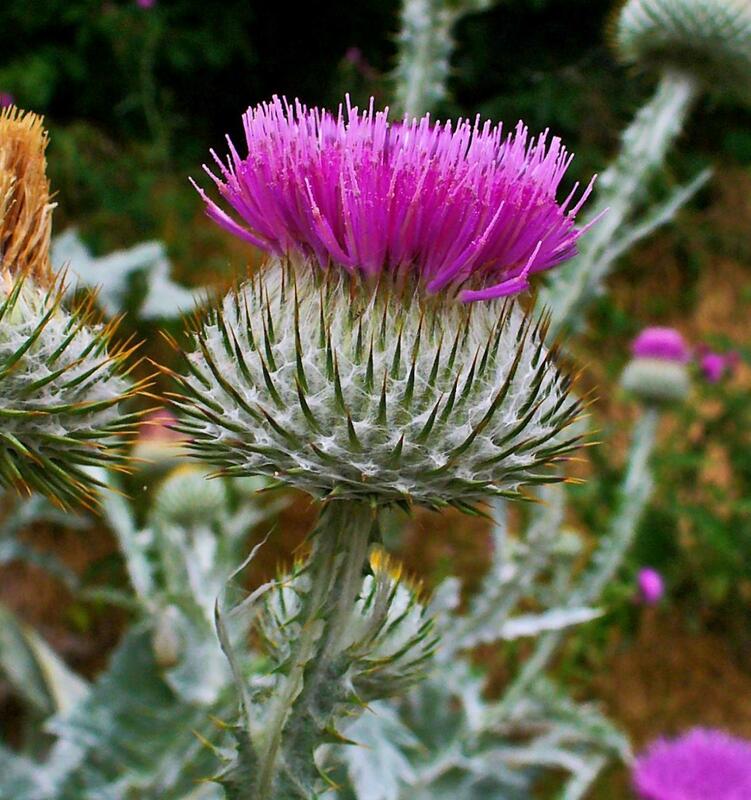 The common name Scotch Thistle comes from a legend that the plant's thorny thickets helped protect Scotland from the Vikings. Oral folklore holds that as Vikings attempted to sneak up at night to attack and raid Scottish villages, they were stuck by the thistles' thorns and cried out in pain, alerting the townsfolk to the attack and allowing them to fight back and drive back the invaders. Following this the Thistle was adopted as the floral emblem of Scotland.